In the last few years I have been to several family gatherings and reunions. These often include a visit to the cemetery where our ancestors are buried. There is something fulfilling about going to the place where our parents, grandparents, uncles, aunts, and cousins are memorialized, even though what is written on their gravestones may be unexceptional and generic. That's one of the purposes of a memorial—to keep in remembrance a person or event. We have two events in our reading today that characterize two people and become their memorials. 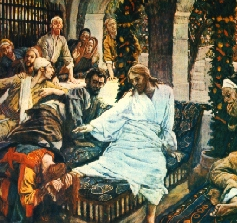 Mary (named in John 12:2-8) pours perfume on Jesus' feet during a feast in Simon's house. When other guests criticize her action as wasteful, Jesus tells them that her lavish demonstration of love will become a memorial to her wherever the gospel is preached (Mark 14:9). Judas Iscariot, in the very next verse (Mark 14:10), makes a decision to betray Jesus. This leads to a course of action that becomes what he has been known for forever after. I'm sure that neither Mary nor Judas were aware, when they were living the events, that they were doing something mementous. The incidents that came to memorialize their lives were, to them, part of everyday living. Memorials left by other Bible characters open our minds to more possibilities. Dorcas (after her first death) was remembered by the collection of clothes she had made for the poor (Acts 9:37-39). Cornelius's memorial was prayers and alms, of which God Himself took note (Acts 10:4). Which brings me to the question, what kind of a memorial am I leaving? What about you? Whatever it turns out to be, a distinguished event or the general impression of our lives, it's sobering to realize I am in the process of building and reinforcing it every day—and so are you. PRAYER: Dear Jesus, I want my life to be a sweet-smelling memorial, like Mary's act of pouring perfume on Your feet. Help me to know how to translate who I am and what I have into such love for You. Amen.